A preschool pizza theme is a fun-filled way to explore one of our favorite foods. This is a food that kids generally LOVE. There are so many toppings and so many ways to make it, every child is certain to have a favorite kind. Use the activities listed below and the kids will learn the history of pizza, how pizza is made and enjoy activities and snacks centered around... Pizza! Start your preschool pizza theme at Circle Time. Go around the circle and ask the children what their favorite pizza topping is. How many children like the same toppings? Have they ever tried toppings like anchovies or pineapple? Give each child a paper plate. Then offer old magazines, construction paper, felt, yarn, buttons.... whatever craft supplies you have on hand. Let the kids design their own pizza. Start with the word "Delizioso", a whole new way to say delicious that the children will pick right up on. Then share with them that although forms of pizza have been eaten for centuries, it's the Italian's that have been credited with the invention. A baker by the name of Raffaele Esposito prepared a meal for Italian King Umberto I and Queen Margherita in the late 1800's. He topped flat-bread with the colors of Italy. He used red tomato, white mozzarella cheese, and green basil. Three blocks of color. Green on the left, white in the middle, red on the right. Start with a large piece of thin cardboard. Make this part of the preschool pizza theme a group activity. Look in magazines for pictures of food to place on the cardboard. 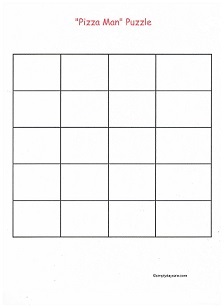 (Remember that these are just puzzles and do not have to contain foods that are actually on a pizza). Let the group paste the pictures on the cardboard covering as much of the circle as possible. Decoupage the entire top of the pizza. Let dry. Cut into pizza slices so each child has a piece to take home. Or...cut a large circle out of cardboard. Let the children paint the circle red (tomato sauce), have them add red circles (pepperoni) small white or green squares (onion and green pepper), small strips of yellow yarn (cheese), or whatever other ingredients you like. Use whatever craft supplies you have on hand. Let dry. At the end of the day, cut it like a pizza, and let each child take home a slice. Print out one copy of the pizza man per child. Have them cut on the lines to create 20 square puzzle pieces. 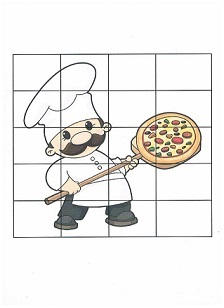 Make one copy of the pizza puzzle graph per child. Let the children reassemble the puzzle on the graph and glue in place. OR... have the pieces pre-cut and let them assemble on the graph. A preschool pizza theme wouldn't be complete without a visit to your local pizza parlor. Many children have never actually seen a pizza being made and will be fascinated by the experience. Set up a pizza parlor area in your daycare for dramatic play during your preschool pizza theme. Use a red and white checked tablecloth, paper plates, cups, and napkins. Make your own laminated pizzas with thin cardboard cut into circles and pictures of food. Make some whole pizzas and some cut into slices. Menu, cash register, and play money. A baker hat for the pizza maker is also a nice touch. *Talk to the owner of your local pizza parlor. Ask for donations. You may get a few pizza boxes or menus and aprons for your dramatic play area. *Frozen pizzas normally have a large picture of the pizza on the front of the box. Cut out and laminate for your pizza play area.